Acosta Middle School and its WaterMarks marker. 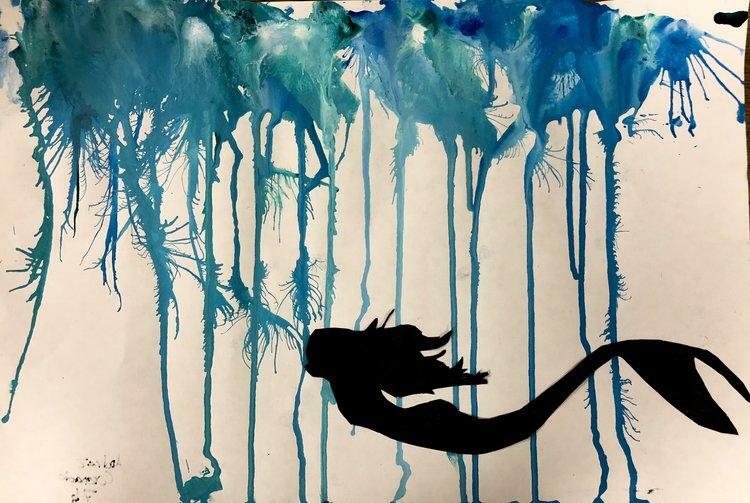 A water-inspired creation from Acosta Middle School student Daisy Montes. WUWM's Susan Bence reports on a new public art project that allows Milwaukeeans to share their water stories. All of us are connected to water. And there's a new public art project that gives Milwaukeeans a chance to tell their water stories. New York-based artist Mary Miss spearheaded the idea. She stepped into the Wisconsin scene in the 1990s when she was asked to contribute to the creation of Milwaukee’s Riverwalk, designed to help connect people to the Milwaukee River. Today, Miss wants to draw more residents to their water. “Allowing people to understand how they’re supported by the infrastructure, what is their relationship to the natural systems. But how to not just tell them that, but get their interest. Hear their experiences. Build off of what they know better than anyone else about their neighborhoods,” she says. Miss’ inspiration crystallized into "WaterMarks: An Atlas of Water and the City of Milwaukee." Using markers — super-sized letters — is the public art project's way to point to elements of Milwaukee's water resources and issues. The first marker, a 5-foot red letter A, stands atop 24-foot aluminum poles outside Milwaukee's Acosta Middle School. 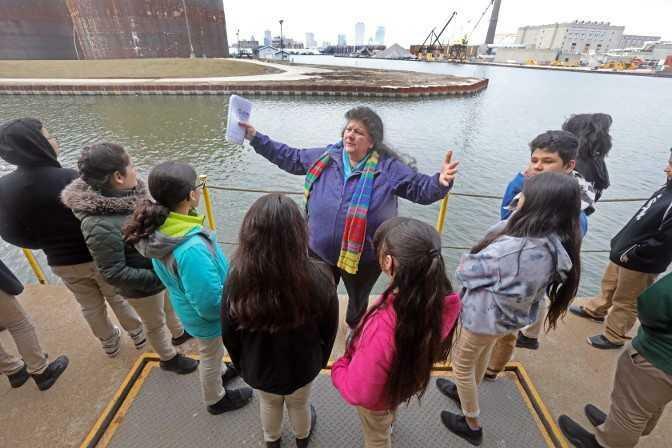 UW-Milwaukee School of Freshwater Sciences researcher Carmen Aguilar (center) introduces Acosta Middle School students to the Milwaukee harbor. Acosta Middle School science teacher Shannon Olson says her students chose the letter A for the marker outside their school. “Because it’s Acosta, it’s agua [Spanish for water], it’s academic and when you think about the grading system, you can’t get higher than an A. That’s our justification for A,” Olson says. The teacher says the WaterMarks’ project augments her work in the classroom where she covers water quality, chemistry and pollution. “So, they absolutely love what we’re learning and how they can see in their own community how it applies,” Olson says. Water inspired this artwork by Acosta Middle School student Andrez Coronado. Part of WaterMarks’ mission is to collect stories of how people connect with water. To help tell their water story, Acosta students drew pictures. Student Marbeya Mendez says, “My dad is from the Dominican Republic. Where he lived, the water was very polluted and so his water was not really clean to drink because people would get sick." Another student, Valarie Vincent, says her mom loves to cook. “When she makes tamales and boils pinto beans … and I just found out that she uses a lot of water to make it and I was kind of surprised – I’m actually getting hydrated with water in my mom’s food,” Vincent shares. In the coming days, a crew will add a plaque to the WaterMarks’ installation. The plaque will have information about the project, the installation at Acosta Middle School and its students’ stories and images. Miss hopes with time, markers will dot Milwaukee’s watery landscape. She’s funneling her energies toward what she envisions as WaterMarks’ icon installation — an imposing smokestack on Jones Island. Miss sees not only a giant letter but an added splash of light. “There’s a big character — W is for water — but on a normal evening it will be lit blue and if it’s going to rain the next day in that evening it will turn red,” Miss says. Miss says the idea is about more than creating a striking image in Milwaukee’s harbor. “The idea is to spread the idea that you as an individual — by not using your bathtub or dishwasher your heavy uses of water the night before a rain — your household can become part of the green infrastructure of the city,” the artist says. That installation has not been scheduled. But Miss is determined to see it through. She’s been dreaming of the illuminated stack since 2014. Not all algae is toxic to humans and animals, but the type of blue-green algae growing in Milwaukee's Veterans Park lagoon is. Earlier this month, the city’s health department issued an advisory against coming into contact with the lagoon’s water.